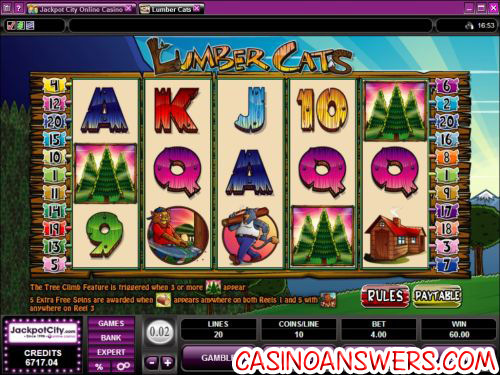 Lumber Cats Video Slot Guide & Review - Casino Answers! Lumber Cats is a 5-reel, 20-line video slot developed by Microgaming, featuring a wild substitute symbol, scatter wins, a gamble feature, free spins and a bonus game. You can play the Lumber Cats video slot game at Jackpot City Casino and All Slots Casino. Coin values on the Lumber Cats slot machine are $0.01, $0.02, $0.05, $0.10, $0.20 and $0.25. Once you have selected a coin value, you can set the number of paylines up to 20 and the number of coins per line up to 10. The lowest total bet you can make on the Lumber Cats video slot is a penny per spin up to the highest total bet of $50 per spin. To play all 20 lines and 10 coins per line, use the “Bet Max” button. For other bets, hit the “Spin” button. The orange Lumber Cat symbol is the highest paying symbol on the Lumber Cats slot game. If you hit 5 of these symbols on an active payline, you can win up to 6000 coins. The Lumber Cat symbol is wild, meaning it will substitute for all symbols except for the Scattered Trees and Log symbols. When the Log symbol appears on reels 1 and 5 at the same time as the Lumber Cat wild symbol appears on reel 3, you will trigger the Log-Roll feature. In the Log-Roll feature, you will be given 5 free spins. The Lumber Cat wild symbol will expand to cover the entire third reel. Any Log symbols that appear on the reels of the Lumber Cats video slot will be turned into the Lumber Cat wild symbol. The Log-Roll feature is played at the paylines and bet of the triggering game. Log-Roll feature wins are added to payline and scatter wins. The Log symbol only appears on reels 1 and 5. The scatter symbol on the Lumber Cats slot game is the Trees symbol. 2, 3, 4 or 5 Scattered Trees symbols anywhere on the reels of the Lumber Cats video slot will pay out 2X, 5X, 20X, or 200X your total bet. 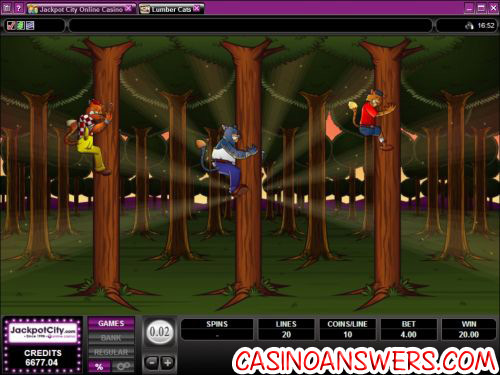 When 3 or more Trees scatter symbols are hit anywhere on the reels, you will trigger the Tree Climb bonus game. The three Lumber Cats are having a tree-climbing race. You must correctly choose the one who is going to win. You will win a prize based on how well your Lumber Cat does. The Tree Climbing feature can be triggered in the Log-Roll feature. All prizes are multiplied by the triggering bet. After any win on the Lumber Cats online slot, you can activate the gamble feature to double or quadruple your win. Guessing the card colour correctly will double your win, whereas choosing the correct card suit will quadruple your win. You can exit the gamble feature by hitting the “Collect” button. Use the gamble feature wisely to greatly increase your winnings at Jackpot City Casino! Payouts are made according to the Paytable. Payline wins are multiplied by the bet per payline. Scatter wins are multiplied by the total bet. Scatter wins are added to payline wins. All symbols pay left to right except for the scatter symbol (which pays any). Only the highest win on a selected payline is paid out. Coinciding wins on different selected paylines are added. The wild symbol substitutes for all symbols except for the Trees and Log symbols. The Log symbol only appears on the first and fifth reels. Hitting the “Expert” button will increase the number of settings available on the Lumber Cats video slot game. You will now have the option of playing 5X or 10X autoplay spins or hitting the “Autoplay” button to use advanced settings. You can set the number of autoplay spins (5, 10, 25, 50, 100, 250 or 500) and stop settings including to stop once all spins are complete and stop if a win exceeds or equals ($100, $500, $1000, $5000 or $9999). You can cancel Lumber Cats’ autoplay mode at any time. The theme is a little bit random, but the Lumber Cats video slot does have enough features to keep the slots player happy along with a good top payout to keep the wallet happy as well. The graphics, sound effects and animation are all very well done and it shows that Microgaming is just as good as any online casino platform when it comes to presentation. To play the Lumber Cats video slot for real money, sign up and make a deposit today at Jackpot City Casino! Are players from the United States able to play the Lumber Cats video slot for real money? Unfortunately, players who are USA-based are not able to play the Lumber Cats slot game for real money at this time. While we all hope this changes, if you are looking for a kitty-themed slot machine, you can play the Operation M.Y.O.W. Slot Machine at the US-friendly Lucky Red Casino. Where to play the lumber cats flash game?